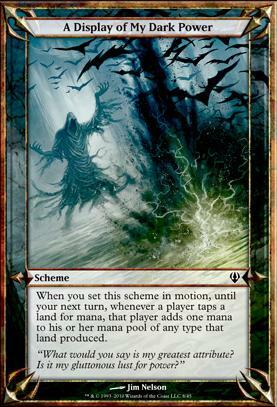 When you set this scheme in motion, until your next turn, whenever a player taps a land for mana, that player adds one mana to his or her mana pool of any type that land produced. A huge CONGRATS on the #1 for Monothopters [Frontier]! By the way, the whole S. "Grim Reaper" Bannon thing reminded me of the old Archenemy Scheme cards (especially the flavor text). A Display of My Dark Power, perhaps? Or Embrace My Diabolical Vision?